Thanks to social media I discovered that Coventry University (their Centre for Agriculture, Water and Resilience) were running a two day bee festival just down the road at Ryton Gardens with the fantastic Steven Falk author of the THE bee ID book – and it was free. I sat through three brilliant talks in the morning with three interesting and very enthusiastic presenters. First there was the aforementioned Mr Falk. How he crammed in so much information in less than an hour I don’t know. He spoke about his book, discovering new species including the use of DNA to prove an 18th century naturalist right and the different families of bee – I don’t think any of us there will forget the Pantaloon Bee! Next up was Andrew Salisbury from the RHS talking about the trials that they’d carried out at Wisley to find out if native, near-native (i.e. Northern Hemisphere) or exotic (Southern Hemisphere) plants were better for pollinators. The answer – depends on the pollinator. It was very interesting to see how they carried out the trial, such a lot of meticulous hard work. I was also interested to hear that they only saw 80 butterflies over the multi-year survey – I am not sure that butterflies visit gardens in great numbers unless you have a buddleia. Finally we had Brigit Strawbridge talking about plants and pollination. She almost contained her enthusiasm for bees! Fact of the day that I learnt was that you won’t spot honey bees on lavender unless it is warm as it takes hot weather for the nectaries to fill up enough for the short tongued bees like honey bees to be able to feed. But brambles keep on providing nectar for days – that explains why the bees love my silver stemmed Rubus and shun the lavender for it! 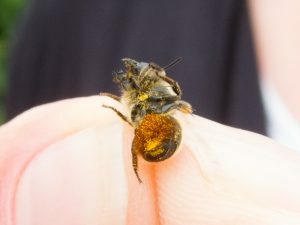 In the afternoon Steven Falk entertained a large crowd on a search for bees around Ryton Organic Gardens – he was hoping for 20, but we were all satisfied with the 17 that we did see – including this Osmia leaiana showing its orange pollen collecting scopa on the underside. The whole festival was put on by BloomsForBees a new initiative promoting Citizen Science and plants for pollinators with a new App and website to help log the bees and the plants they are enjoying. I had a fantastic day, made some new friends and renewed my love of bees. A recent workshop about solitary bees that suggested that there was no point trying to ID solitary bees unless you were willing to learn latin and kill the bees for subsequent dissection dampened my enthusiasm quite a lot. Steven Falk loves giving bees English names that make them more memorable and showed how much there was to discover without the aid of a killing jar and microscope. And, as for his knowledge of flowers… All I can say is if you get the chance to go on a Bee Walk or Workshop with Steven – grab it and his book which has been sitting unused on my shelf for too long.